Growing up, my favorite gum was, beyond a shadow of a doubt, Juicy Fruit. These were the days before a million varieties of gum. The options were pretty much Trident, Extra, Big Red (ew), Juicy Fruit, Chiclets (ew), Bazooka, Bubble Tape, Dubble Bubble, and Big Chew. 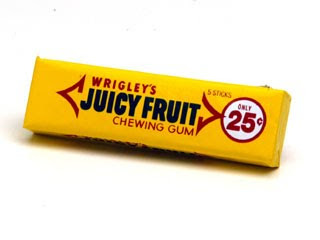 Juicy Fruit was 25 cents of honest goodness. I knew it tasted nothing like fruit, but I didn't care (unlike Apple Jacks, which were downright false advertisement). It was sweet, and it was... juicy! Today, however, "juicy fruit" means something totally different to me. Last night my husband said, "I brought something home for you. It's on the back porch." I was half expecting a puppy from the glee in his eye. It was a box he had picked of fresh-from-the-orchard peaches, pears, and apples (nectarines are so "last week's news"). From my sticky fingers, forearms, and elbows I can assure you... this is some juicy fruit.